So I guess I’m technically an author now. and that’s how many I wrote. You can learn more about them by clicking these hyperlinks! Hello, I would like to buy your book about ancient myths for my girlfriend for christmas. I did not find a “buy” button. Would you please let me know what to do? If you click on Zeus Grants Stupid Wishes above, it’ll take you to a page with links to a couple of places where you can buy the book. It’s available on Indiebound, Amazon, Barnes and Noble, and Penguin’s own website. 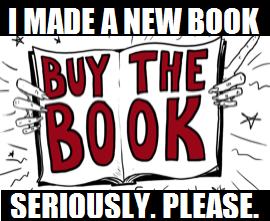 You can also request it at your local bookstore! Hope that helps.